Corridors are linear pathways that connect places and allow for the movement of people, goods, or wildlife. They often center around transportation infrastructure such as streets, highways, and public transit, but can also center around historic sites, habitats, rivers, or other natural features. They may be regional in scale, as in a heavy rail corridor, or extremely local, as in a retail corridor along a city thoroughfare. 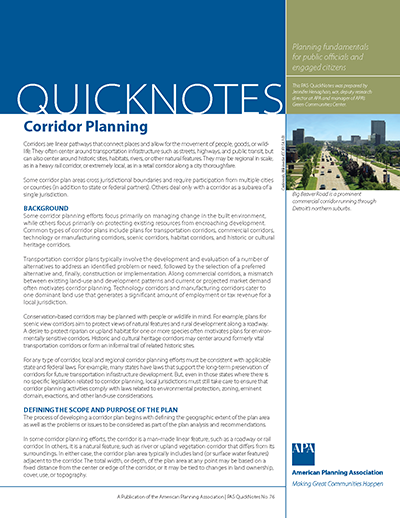 This edition of PAS QuickNotes introduces the concept of corridor planning and provides a primer on the corridor planning process.